Better Farming February 2017 edition features Pat Jilsen, who is passionate about saving rural schools, on the front cover. 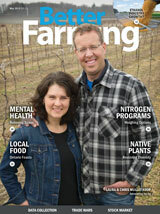 The magazine also highlights articles on Soil Organic Matter – Planning Crop Rotation, Satellite Imagery – On-Farm Uses, Poultry Production – Safety & Innovation; Hydraulic Systems – Maintenance Tips. 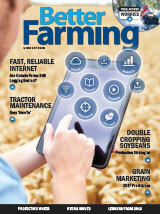 Better Farming January 2017 edition features the following articles: Fast, Reliable Internet -- are Ontario Farms Still Lagging Behind, Tractor Maintenance -- Easy 'How To', Double Cropping Soybeans - Production Strategies, and Grain Marketing - 2017 Predictions. 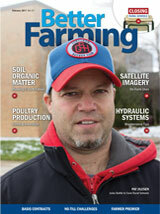 Better Farming December 2016 edition features Rudy Heeman on the front cover. It also includes the following articles: Corn Hybrids -- Planning for 2017, OAD Milking - Production Results, Resistant Weeds - Problem Solving, and Alus Canada - Conservation Projects. 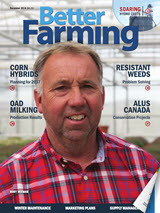 Better Farming November 2016 edition features Paul Arva on the front cover. 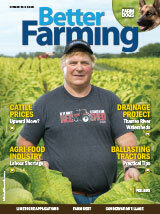 The magazine includes articles on the following: Cattle Prices - Upward Move?, Agri-Food Industry - Labour Shortage, Drainage Project - Thames River Watersheds, and Ballasting Tractors - Practical Tips.